Poverty is a slippery word that brings up different connotations to different people. There is the absolute poverty that inhabits much of the world where blighted landscapes are inhabited by nearly starving children. A world where the struggle is to survive is just that, and not whether you can get a new pair of designer jeans or have to settle for some store brand. This is true poverty, a poverty most Americans have never seen except on TV. There is of course a second type of poverty, a poverty not so easily defined. Relative poverty is just what it implies, it is the idea that some of society have significantly less then others. It is this second form of poverty that inhabits the western world and is the basis for so much consternation among politicians and liberal activists alike. The poverty that exists in America and much of Western Europe is one based in envy as much as it is in reality. Nothing drives this point home more then the constant flow of illegal Mexican workers that stream across the southern border of the U.S. Most of these make the treacherous trek across the border so they can get some low paying job and live in a small apartment or share some house often in less then stellar locations. The reason they do it is because, in comparison to where they come from, such a life is relatively luxurious. What Americans see as poverty they see as living the good life! There is also another famous incident that shows the relativeness of poverty. Soviet diplomats during the cold war took pictures of people in poor neighborhoods in the U.S. watching their color TVs. They meant to show western decadence but what it showed the people of the Soviet Union was the poor in America were better off then they were in their communist utopia. Of course the “poor” in a developed country like the United States do not want to hear that they live a relative life of ease compared to those in the third world. Politicians, for their part, rarely make the distinction between absolute and relative poverty. The truth is, people living in absolute poverty are virtually non-existent in capitalist countries. The number of people living in relative poverty on the other hand is on a sliding scale that happens to be in the politician’s hands. By picking some arbitrary standard of living or income level they are able to create a constituency which they can exploit. Using heated rhetoric, and armed with taxpayer dollars, they can target the relatively poor and exploit them for political gain. 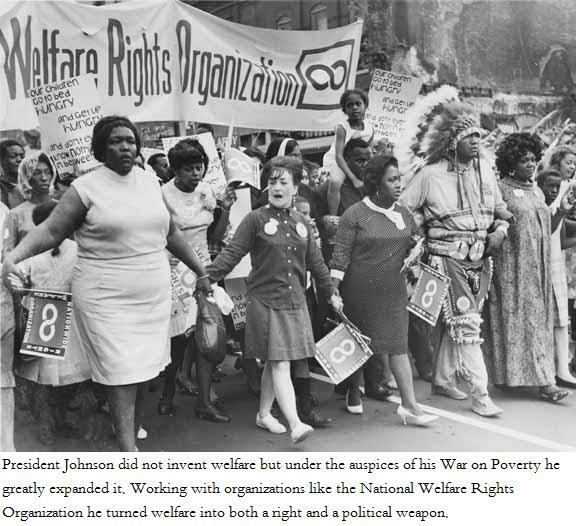 In 1964 President Lyndon Johnson declared a War on Poverty. He was the first president to put a substantial amount of the United States’ resources to work for the expressed purpose of eliminating poverty. The reason given for this war was that the government could do something about poverty and it had a moral responsibility to do so. The war on poverty, as it would turn out, was to be one of the greatest experiments in economic justice and social engineering in the country’s history. Now, nearly five decades since the War on Poverty was declared, it can be safely said that poverty won (as if there was ever any doubt about the outcome). The fact is Johnson’s war on poverty, and other programs like it, are not plans to alleviate poverty at all. They are just meant to make life for those at the bottom a little easier in hopes that they would in turn vote Democrat. Black voters were in the Democratic cross hairs in the 1960′s and 70′s and government programs were one of the tools of choice to get them into the Democratic fold. Johnson sent legions out into inner city neighborhoods signing people up for government largess. Johnson and the Democratic Party became the worlds largest group of sugar daddies. At the same time groups of black activists were going around telling the youth that the “man” owed them and that they my as well take all they can get. Of course rules for those receiving this money had been put in place; rules like mothers without fathers would be supported without question but two parent homes were likely to be turned down. Teenage girls learned quickly that if they were willing to have a couple or more illegitimate children they could essentially retire before they left high school. Free public housing, a welfare check and food stamps for life! Not a bad deal for those with little ambition and told they have little or no hope for getting ahead. The War on Poverty was creating dependent voting blocks and destroying families in one fatal swoop. Now as with other such legislation and programs, many of those supporting them were not just out for votes. Many, especially young Democrats, bought into the plan and thought they were doing good. It is very unlikely the President Johnson was one of them. Him and the Democratic hierarchy were old time bigots that had decided it was easier to exploit the blacks in the U.S. then suppress them. The failure (or success if you will) of the welfare programs were dramatic. Not only did they (welfare and public housing) not make poverty go away, it made low living standards a way of life for generations of Americans. Systemic multi-generational poverty became part of the American landscape in a way in had never been before. The slow advancement of blacks in society that had been building was stopped cold. The image of the strong black family was shattered, illegitimacy soared and poor black neighborhoods became known as just hoods. For sure their was similar damage done to white and Hispanic families who were caught in the welfare dragnet but they were not the focus of the Democratic machine’s vote strategy and suffered far less. To add insult to injury the Democrats started pricing black teenagers out of jobs by continuously raising the minimum wage. Instead of alleviating poverty the welfare system institutionalized it. It destroyed families and took away human dignity. When combined with an unreasonable minimum wage that made getting a job impossible for many inner city youth, it created a fertile ground for crime and gangs. Once safe neighborhoods became high crime zones and incarceration rates of black Americans became a national disgrace. It is hard to imagine, but before Johnson sent out his legions into inner city to sign people up for welfare two parent families were the norm, most poor black neighborhoods were relatively safe and black youth were likely to stay in school and get jobs. After Johnson’s welfare program you would find most black children being born out of wedlock, crime escalating to epidemic proportions and many black teenagers ending up on the street filled with rage and emptied of hope. This is not just this authors opinion. Many books have been written on the subject some of the most notably are by Economists Thomas Sowell and Walter Williams (Two good books on the subject are available here). Star Parker, former welfare queen, is also a quite articulate spokesperson against the system that has so undermined poor Americans, especially black America. Some Democrats have also admitted that the welfare system has been a disaster. President Obama said before Pastor Rick Warren that he was wrong about the welfare reform signed by Bill Clinton and that it did help move people out of the cycle of poverty. Other liberals have been more forthcoming; Juan Williams is on record saying the system needs further reform and there needs to be a work component to it (the famous Republican concept of workfare), Bob Beckel went even further and apologized on behalf of liberals for making so many people dependent on the government. Despite this, most progressive liberals continue to promote these programs that have caused so much damage. The question to ask is why? What these people do not realize is that poverty is a refection of a persons productivity. They cannot conceive that most so called poverty is self inflected. They do not accept that people who live at a constant low level of productivity are somehow culpable for their situation. That short of some debilitating handicap, the source of poverty is likely to be low skills, poor education, bad work habits, drug addiction or even just a preference not to work if you don’t have to. [Not counting those just starting out, or who fall temporarily into poverty due to some event, for them poverty is a temporary aberration not a way of life] The fact is the source of most systemic poverty is the personal choices of those in it. It is also true those born into areas with bad schools are often stuck with them. Unfortunately education in these areas is often further devalued by a culture that often sees high grades and wanting an education as “Acting White”. It should go without saying that if you produce little you will have little. Those with the skills and knowledge to become valuable to society prosper if they are willing to apply them; those that don’t have them or aren’t will to apply them fall behind. No magic wand of government largess can change this. Throwing money at those who are inherently unproductive does not make them more productive, if anything it encourages them to produce less! The truth is attacking the root causes of poverty is not easy, even the relative poverty seen in the U.S. It is a problem that is compounded in the black community. Blacks were the focus of the governments destructive welfare programs for half a century. They have also been subjected to an onslaught of voices from within the community telling them they are owed by society and trying to get ahead is somehow acting white. A two prong attack by welfare peddling economic and social justice advocates on one side and poverty pimps on the other. Fortunately there are solutions out there and most do not involve large government intervention. In fact many are based in government getting out of the way. Things like improving schools by letting parents have school choice, enlisting black leaders to decry the culture of ignorance that devalues education, stop subsidizing people’s unproductive way of living and lowering the minimum wage to allow people to at least get a foot on the ladder and start rebuilding families. There are solutions but no magic bullets, no government program or public spending that will magically make it all go away. It will take hard work and time to heal the black community. Unfortunately the Progressive liberals who for a large part got us into this mess have little interest doing the work to fix it. They find it easier to throw rocks and money then work on solutions. They also have no interest in dismantling programs that have benefited them so much politically. Conservatives know what needs to be done but are attacked by both progressives who fear loss of a desperately needed voting block and those in the black community that fear the loss of government support. This means the real reform that is needed will have to come from within the black community itself. It is going to take strong black leadership to get the poor in the black community to reject the sharecropper way of life and move off from the government plantation. Excellent writing. Of course what the anti-poverty programs really steal is people’s self esteem and their future.